The world lost a beautiful woman on January 4, 2016. 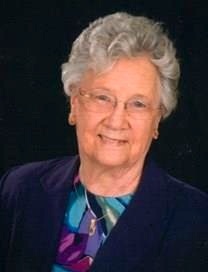 Wilma Rose (Finney) Bachman of Olathe, Kansas was born February 3, 1926 to L.T. and Roxie (McGhee) Finney in Purdin, Missouri. She graduated from Shelby High School in Shelby, Missouri. On April 29, 1944 she married Wilbur R. Welch and he died July 31, 1945. On May 20, 1948 she married Arnold W. Bachman and he survives of the home. Their marriage of 67 years has been an example of the power of love and commitment for their children and grandchildren. Wilma dedicated her life to raising her family and helping others through volunteer work with the Salvation Army Auxiliary, Olathe Catholic Charities Auxiliary and St. Mary’s Food Kitchen. She was preceded in death by her son Christopher Bachman on June 4, 2013 and brothers Don Finney and Boyd Finney. In addition to her husband, she is survived by brothers Larry (Rita) Finney and Darrell (Joannie) Finney and sister Virginia (Gail) Neis, sons Duane (CeCilia) Bachman and Phillip (Sun Hui) Bachman and daughters Joyce (Alvin, Jr.) Bailey and Jeanette (Russell) Magathan. She deeply loved and will be missed by her 13 grandchildren: Michael Bachman, Eun (Bachman) Turpin, Ashley Bachman, Arnie Bachman, Jessica Bachman, Genevieve Bachman, Ryan Bachman, Jordan Bachman, Matthew Bailey, Andrea Magathan, Travis Bailey, Rachel Magathan, Corey Bailey and 9 great-grandchildren: Micheal Bachman, Isaac Turpin, Morgan Bachman, Eli Turpin, Kammee Bachman, Mina Turpin, Lee Whitney, Jordan Bailey, Makiah Moore. Visitation will be Monday, January 11, 2016 at 10:00am with service following at 11:00am at McGilley-Frye Funeral Home Olathe, Kansas. Burial in Resurrection Cemetery, Lenexa, Kansas. Memorials can be made to the charity of your choice.